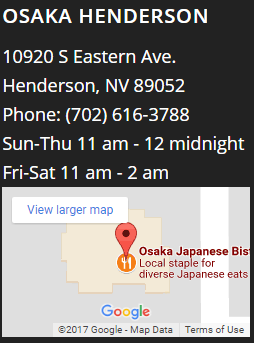 We thought it would be a good time to reintroduce our customers to teppanyaki dining. With spring and summer’s longer days coming up, our pleasantly warm Las Vegas evenings encourage people to dine out more often. Dinner at a traditional teppanyaki grill is a fun and different dining experience that is also tasty and healthy. Teppanyaki is a Japanese-style dining experience that gives customers a front-row seat as a chef prepares their meal table-side on a sizzling iron griddle. The Japanese word “teppanyaki” is a combination of “teppan” which translates to iron plate and “yaki” which means grilled or pan-fried. Lunch or dinner at a teppan grill is a crowd-pleasing treat – a flaming onion volcano is sure to put a smile on any diner’s face – with a wide variety of entree choices from lobster tail to Kobe beef. 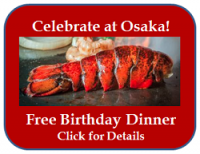 While some claim that teppanyaki dates back 200 years, the Japanese restaurant chain Misono is credited with a strong hand in creating modern teppanyaki and in 2015 celebrated the 70th anniversary of their first “teppanyaki steak” served in 1945. Shigeji Fujioka opened his Misono restaurant in Kobe and his teppanyaki steak became popular among American officers stationed in Japan after the war. The foreigners enjoyed the blend of high-quality meat and watching the chef work on the teppanyaki grill. Word soon spread to celebrities and food lovers about this unique dining experience. The flat, hot cooking surface is key to the flavorful preparation of Teppanyaki dishes. Teppan grills, which are usually propane heated, can reach temperatures up to 450° C. The solid, griddle-style surface allows for the cooking of small volume ingredients ingredients such as rice, eggs and vegetables that will accompany the main meat dish, so your entire meal is prepared fresh before your eyes. 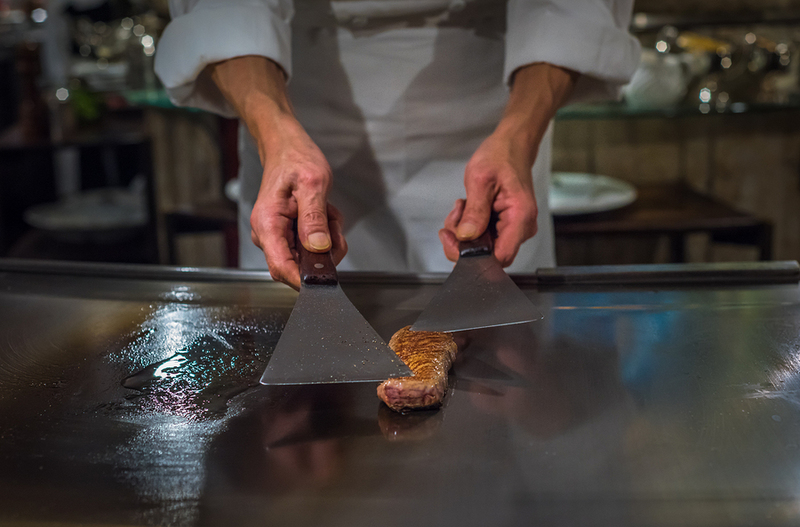 Unlike a typical restaurant meal, which often cools as it is brought to the table, the teppanyaki grill allows for every bite of your meal to be hot and fresh, as you eat while the chef works by your side on his hot cooking surface. The chef prepares the entire meal table-side from soup and salad to appetizers to vegetables, rice and entrees. It takes years for teppanyaki chefs to perfect the knife work and other skills required to cook in front of customers, as well as to learn the presentation style and tricks that make the Teppanyaki an entertainment experience as well as a meal. Since teppanyaki started in Kobe, beef is front and center on the menu with diners choosing from such cuts as rib eye, New York or filet mignon. Top restaurants, including Osaka Japanese Bistro, offer certified Kobe beef from Japan. Teppanyaki, however, is not just for steak lovers as chefs also prepare chicken and pork. 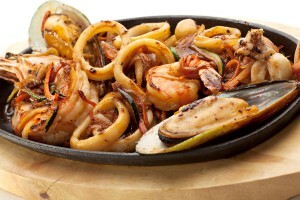 Seafood teppan grill may feature anything from shrimp to jumbo sea scallops to calamari. In 2006 the Japan Teppanyaki Association was formed with the aim of improving teppanyaki chef skills and promoting the dining style. The association helped implement a system of teppanyaki skills with chefs taking exams and earning certifications all the way up to Semi-Master and Master. Teppanyaki continues to evolve with chefs around the world putting their own touch on the cuisine. You can find teppanyaki grills on every continent from Dubai to Cape Town to Las Vegas. 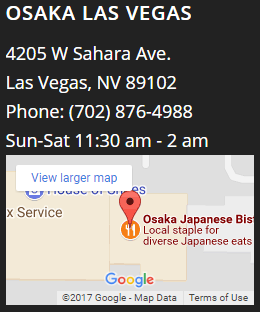 Osaka Japanese Bistro has a long tradition of preparing teppanyaki for our guests. 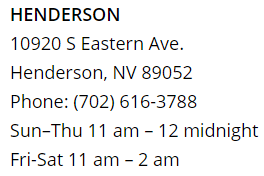 Teppanyaki is available at both our Las Vegas and Henderson locations. It’s a great experience for groups, so call ahead to reserve a spot and bring your friends for a fun time. With our extensive Teppan Grill menu, you can enjoy a broad range of seafood, meats and side dishes, all prepared in traditional fashion by our trained teppan chefs. Come in tonight for a memorable meal and fun experience at our teppan grill.